This entry was posted in News and tagged Andrew Cashner, jedd gyorko, Nationals Park, Recaps, rene rivera, San Diego Padres, Tanner Roark, Washington Nationals, While You Were Drinking, yonder alonso. Bookmark the permalink. Sometimes things get a little fuzzy after a morning at the McDonald’s drive-thru, trying to get there before they stop serving breakfast. Because your McGriddle addiction is real. So here’s a friendly reminder of what you might have missed while you were drinking. 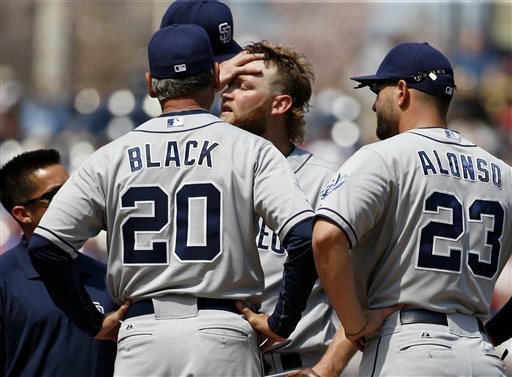 The Padres (11-14) dropped another game to the Washington Nationals (14-11) yesterday, losing 4-0. Andrew Cashner was pulled after pitching 6 innings, with 4 runs on 9 hits and 1 walk with 5 strikeouts. If it wasn’t for the official scorer’s change of heart on a ball that Jedd Gyorko misplayed that probably would have resulted in a double play, the Padres would have had 4 errors on defense instead of 3. Tanner Roark looked like Greg Maddux out there, pitching a complete game on 105 pitches with 3 hits, 1 walk, and 8 strikeouts. All told, the entire game was just a case of ugly baseball from the Friars. We get some more breakfast baseball this morning at 10:35 am PDT when Ian Kennedy faces off against Taylor Jordan in the series finale from Nationals Park in Washington, D.C.
It’s not even 10:30 in the morning and it already feels like this Padres game is over. This is discouraging. Oh yes Mike, please hang around for another half-inning so we don't have to talk about the game. How's Taco Tuesday looking? Great news for you if you had Rene Rivera breaking up a perfect game with one out in the sixth inning. This just might be the Padres' Wertht game of the season. 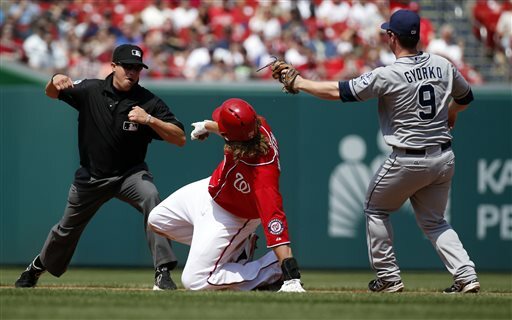 The Nationals challenge Jayson Werth being called out at second and after review, the call is overturned to safe in the 5th inning. Rene Rivera ends Tanner Roark‘s perfect-game bid with one out in the 6th, with a single to center. Andrew Cashner pitches six innings vs. the Nationals, allowing four runs on nine hits and a walk while striking out five.